Improving co-operation between nations' farming and forestry sectors will help reduce deforestation and improve food security, a UN report has suggested. Between 2000 and 2010, tropical nations saw net forest loss of seven million hectares per year and a net gain in farmland of six million hectares. Collaboration between the sectors would reduce environmental damage and improve social and economic outcomes, it said. The report says policies that recognise eco-services can help protect forests. The findings have been published in the UN Food and Agriculture Organization's (FAO) State of the World's Forests (Sofo), a biennial report that provides data to help inform policymakers and decision-makers. "The new Sofo report is about the relationship between forestry and agriculture," said Eva Muller, director of FAO Forestry Policy and Resources Division. "What comes out very clearly is that while it a lot of the [deforestation] was taking place in the temperate zones, in the more recent years it has been focused in the tropics. "There has been a net forest loss of about seven million hectares in tropical countries. At the same time, there has been a net gain in agricultural land of six million hectares. You can deduct that a lot of the deforestation is taking place to gain more land for agriculture." The report showed that the greatest net loss of forests and net gain in agricultural land between 2000-2010 occurred in low income countries, where rural populations were growing. It added that large-scale commercial agriculture accounted for about 40% of deforestation; subsistence farming was responsible for 33%; infrastructure 10%; urban expansion 10%; and mining 7%. But it said that there were large regional variations within those figures. For example, large-scale agriculture accounted for 70% of deforestation in Latin America but just one third in Africa, where small-scale agriculture was the biggest cause of deforestation. 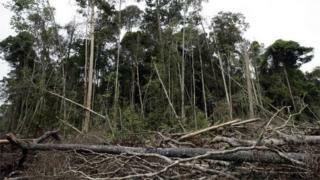 Ms Muller told BBC News that the current pattern of deforestation was unsustainable but added that were countries that showed that effective policies could increase agricultural production and improve food security without cutting down forests. "Our analysis shows that in the past 25 years, there have been more than 20 countries who have maintained or actually increased their forest cover while, at the same time, making progress towards food security," she observed. "The message is that you do not have to deforest in order to achieve food security." Among the common features of nations that were delivering increased food production while reducing deforestation rates was secure land tenure and effective land-use planning. "You need to have coordinated policies between forestry and agriculture, because in many countries the policies for agriculture are not co-ordinated with forestry policies at all; sometimes they even contradict one another," she added. "In countries that have achieved this there is more collaboration, improved investment in both improving agricultural production and the sustainable management of forests." One historic problem has been that agriculture was more financially lucrative than forestry, therefore there was little incentive not to fell trees. Ms Muller acknowledged that this was a problem. "However," she added, "if you look at a country like Costa Rica, they have made huge progress to solve this problem by paying for the environmental services that the forests provide. "Forests, in the long-term, are very important for agriculture because they regulate water flow, protect soils, control climate. "But these are all indirect benefits that are not normally at the forefront but if you recognise these benefits financially, and offer an incentive to farmers to maintain at least some of the area in forests, you can protect these benefits. "This is a very smart way of doing things." This is the first Sofo report to be published since the international community adopted the 2030 Sustainable Development Goals (SDGs). In his foreword to the report, FAO director-general Jose Granziano da Silva highlighted the need for greater collaboration between the forestry and agriculture sectors. "Forests and agriculture have an enormous role in achieving the 2030 Agenda's historic commitment to rid the world of the twin scourges of poverty and hunger," he wrote. "However, this urgently requires closer collaborations and partnerships, cross-sectorally and at all scales."